As a private investor managing your own share portfolio you have to achieve two things over the long haul to consider your efforts a success. First and foremost you have to make money. This means doing better than if you had put your money in a savings account. The second thing you need to try and do is to beat the returns of the stock market as a whole. If you fail to do that they you would have been better off sticking your money in a cheap index tracking fund. The good news is that private investors are quite capable of beating the market. In fact, in many ways they are perfectly placed to do so. It requires some time spent researching companies and their shares, but more importantly, it involves investing your money in a smarter way. To be a smarter investor you need to ignore what has passed for conventional investing wisdom for too long. One of the main bits of advice people get when they begin investing is to spread their money across lots of different shares. This is known as diversification. This is sensible advice – up to a point. Having your money invested in just one share is too risky and could have a devastating effect on your financial health if you have backed a dud share. Yet, having your money spread across lots of different shares rarely makes sense either. However this is how many professionally managed share portfolios are actually run. Why is this? It is because many fund managers are frightened stiff of running a high conviction concentrated portfolio containing only their best investment ideas. They have been taught that this is risky behaviour. They are scared of running a portfolio that looks different to the market they are trying to beat. This is because if you are a fund manager and you set up a fund that strays too far way from the makeup of the market index (a fund seen as having a large tracking error) and your fund underperforms, you can quickly find yourself out of a job. Not only that, but teams of investment consultants who monitor your fund will say that you have taken lots of risk. Risk in the eyes of the professional investing community means underperforming the market or having a portfolio whose value moves up and down a lot (volatility). I prefer to see investment risk in terms of losing money. This comes from investing in bad companies and/or paying too much for shares. This crazy way of thinking by many professional investors is why so many funds own large numbers of shares. By this I mean over 50 and many own over 100 (you can see this information in ShareScope & SharePad). This often results in a bad deal for the investors who have invested their savings in them. By owning large numbers of shares, the overall return of the portfolio tends to be watered down (the results of good shares get offset by mediocre or bad shares) and becomes very similar to the returns of the market as a whole – and is often worse. The bottom line is that to beat the stock market your portfolio has to be significantly different from it. The best way to do this is to concentrate your portfolio on a few of your best ideas. I firmly believe that this can be done with 10-15 different shares or fewer. If you look at the track records of successful investors you will find that many of them have practiced a strategy of concentrated investing. Warren Buffett, Charlie Munger and John Maynard Keynes all produced exceptional returns on their portfolios by running portfolios with only a few different investments. Peter Lynch is an exception to this rule as he tended to own more than 100 different shares. The fact that concentrated investing has been a successful strategy is borne out by a large proportion of the top performing UK professional funds over the last five years. Whilst it is true that the funds in the table above don’t consist of as little as 10-15 shares, they have a lot fewer investments than the vast majority of professionally managed funds. Levels of concentration in the top ten holdings can be very high as seen by Baillie Gifford Long-Term Global Growth, Neptune UK Mid-Cap and Lindsell Train Global Equity. As you can see, if you have a concentrated portfolio and your convictions are right you can achieve some very impressive investment returns. Bear in mind that over the last five years the total return of the FTSE-All Share index has been just over 60%. The funds above have trounced this index and have made a significant amount of money for their investors. To me, this is how most investors should be running their portfolios. It is easily applicable as much to short-term traders as it is to long-term buy and hold strategies. I practice concentrated investing with my own portfolios. My SIPP has 16 shares and my ISA has only 10. Contrary to academic theory, concentrated investing need not be risky either as long as you have done your research, selected the right investments and not paid too much for them. You do not need to own lots of shares to be a successful investor. You just need to own enough of the right ones. This means that an investor does not need to spend a lot of time monitoring a huge portfolio of shares once they have bought them – perfect for the private investor who has other things to do with their life. Only invest in good quality companies where you have a high conviction that profits can continue to grow or the shares are materially undervalued. When you find such a company be prepared to put a significant chunk of your portfolio into it. Research companies extensively. 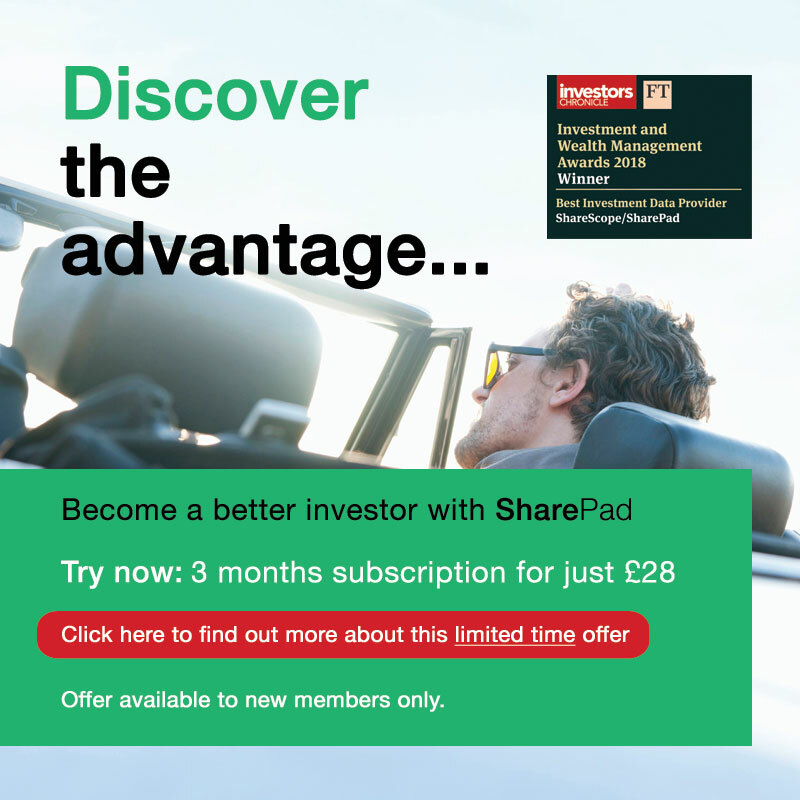 With a subscription to SharePad or ShareScope you are well placed to thoroughly research a company and its shares. This is a crucial part of the strategy. Concentrated investors control their risks by researching a company and getting to understand how it works. This research requirement means that you can only really hold a portfolio of 15-20 shares at most. Spread your investments across different industries and sectors of the economy. Don’t own too many shares in the same line of business. If something bad happens then you can end up losing a lot of money. By owning shares in different types of businesses you can protect yourself against this. Don’t buy a different share just for the sake of it. Measure any new investment idea against your current portfolio holdings. If the new one is not as attractive as your existing shares then put more money into them. Hold the shares for as long as possible. You need time for growing profits to compound in value and don’t need to waste money continually buying and selling shares. Only sell your shares if the underlying business deteriorates and cannot recover. Don’t pay too high a price for a share. Look at the valuation of a share relative to similar ones and other investments such as bonds. Overpaying for a quality business will not make you richer. Don’t be afraid to hold cash if you can’t find a good investment at the right price. Use your spare time to build a watchlist of great companies that you would like to buy at lower prices. Once you have set up your portfolio you need to keep a close eye on it. By this, I don’t mean obsessing about the daily or hourly movements in share prices. I am talking about the kind of things which affect the business of the company you are invested in. Both ShareScope and SharePad make it easy to tune out the daily noise of the stock market and concentrate on the information that matters. SharePad, as a newer product has more tools for doing this, but ShareScope has plenty. I use SharePad myself. In SharePad, you can set up a series of alerts for news events, share price changes, broker recommendation or forecast changes, and technical analysis signals. I use these features extensively which mean I don’t even have to be logged in to SharePad to be aware of what’s going on. 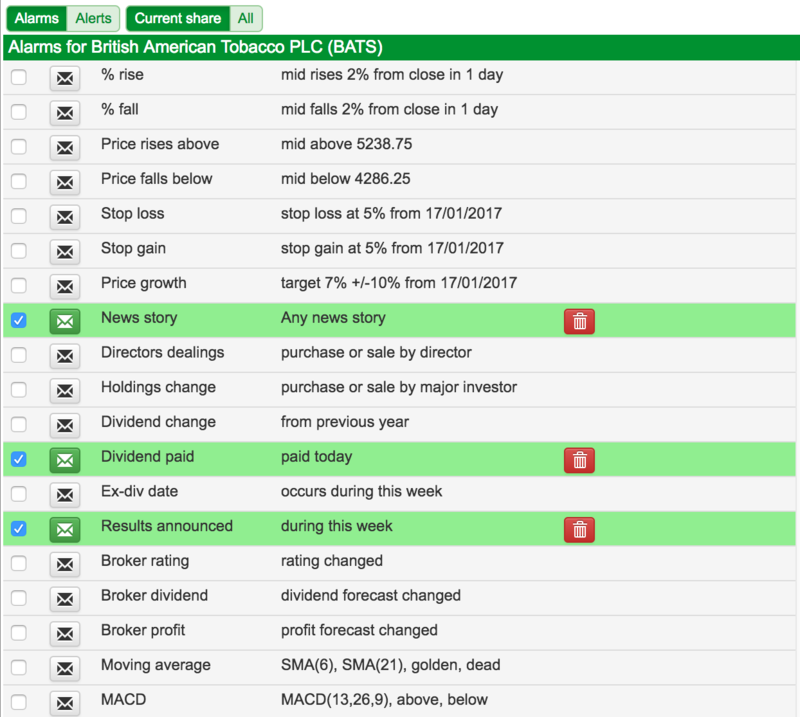 For example, let’s say you owned shares in British American Tobacco and set up an alert in SharePad as shown below. 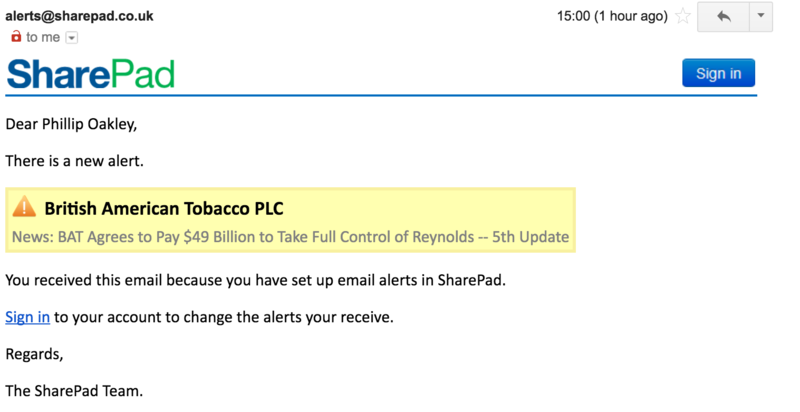 When an event triggers one of the alerts, SharePad sends me an email to tell me about it. This means I can stay up to date with my portfolio even when I am out and about. 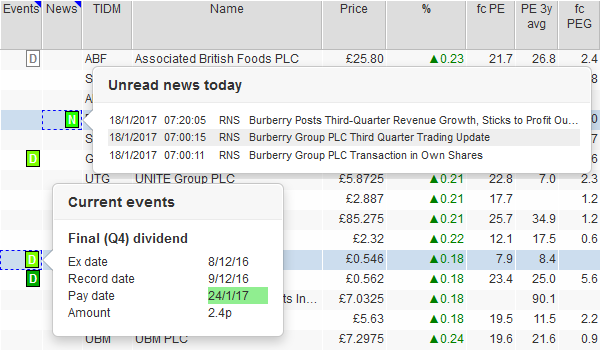 If you are logged in to SharePad, an alert message will appear in the bottom left hand corner of your screen.